Of all the challenges visitors and recent transplants face in getting acquainted with Boston, perhaps none is more daunting than learning the oddities and sometimes frustrations of navigating the Boston subway. The Massachusetts Bay Transit Authority’s system, more commonly known as the “T,” can be a confusing mix of stops, transfers, and misleading information unless you understand some of the basics. The T consists of five separate lines, each of which connects at several locations within the city. A passenger can ride the T by purchasing a CharlieTicket (named after the 1948 folk song, "Charlie on the MTA”) at most stations. These tickets can be purchased for individual or multiple rides, depending on the amount of time between uses. A single ride on the T costs $2.25. A monthly pass, good for unlimited subway and local bus rides can be purchased for $84.50. Other fare discounts exist for seniors, students, and children. Visit our breakdown of the best pass option for your trip. Before you ride, pay close attention to the subway map in order to get a feel for where your stop is, whether or not you will need to transfer in order to get to your destination and try to decipher whether you’ll need an Outbound or Inbound train. Let’s take a look at some things to expect from each of the five lines. Popular destinations along the way: Museum of Science, TD Garden, Government Center, Back Bay, Fenway Park, Boston University, Northeastern University, Boston College, Symphony Hall, Museum of Fine Arts, Boston Common, State House. The B train can be taken outbound as far as Boston College. The C train passes through Brookline along Beacon St. on the way to Cleveland Circle. The D train passes through Brookline village en route to Riverside Station. The E train can be taken to Heath St. by way of Northeastern University. All trains, except the E branch, can be picked up at the Kenmore Square/Fenway Park station. To take the E, you must get off and transfer at Copley Station. All branches can be picked up at all stations prior to these stops, so be sure and verify which train you board. Everybody, sooner or later, finds him or herself on the wrong branch of the Green Line. Unfortunately, unless you realize by Kenmore, where one can navigate between the inbound and outbound tracks, it may cost you an extra fare. Trains running westbound are free when they emerge above ground. For the B, C, and D branches, that’s the stop after Kenmore. For the E, it’s the stop after Prudential. The Green Line also connects with the Red (Park Street), Orange (North Station and Haymarket), and Blue Lines (Government Center). Popular destinations along the way: Harvard Square, Massachusetts Institute of Technology, Massachusetts General Hospital, South Station, University of Massachusetts – Boston, Boston Common, State House. The Red Line begins at Alewife Station in Cambridge and splits into two branches once it reaches JFK/UMass. The Ashmont Branch can be taken as far as Dorchester. The Braintree Branch can be taken into Quincy and Braintree. MBTA garage parking is available at Alewife, Braintree, Quincy Adams, North Quincy, and Quincy Center stations. The Red Line also connects with the Green Line (Park Street) Ornage Line (Downtown Crossing) Silver Line (Downtown Crossing, South Station). Popular destinations along the way: Revere Beach, Suffolk Downs, Logan International Airport, New England Aquarium, Government Center. If traveling from Logan to popular destinations such as the aquarium or Faneuil Hall, the Blue Line is your best bet. For city dwellers looking to catch some summer rays, the ride out to Revere Beach is an easy one. Many of the stops within the city are close together. For instance, if you’re looking to get from Bowdoin Station to the aquarium, it’s an easier walk than it is to spend time or money on the train to get there. The Blue Line also connects with the Orange Line (State Street) and Green Line (Government Center). Popular destinations along the way: TD Banknorth Garden, Haymarket Square, Downtown Crossing, Back Bay, Arnold Arboretum, Chinatown. The Orange Line runs from Malden to Jamaica Plain. 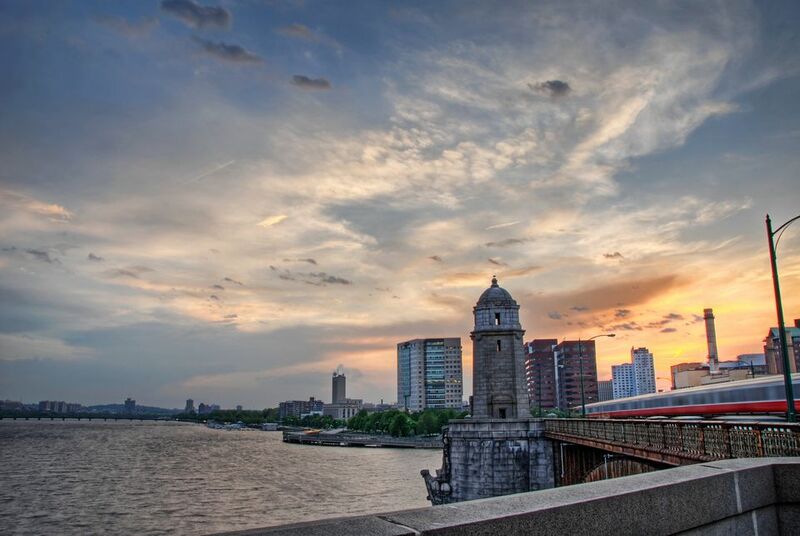 It is an essential line that connects to many of the city’s vibrant neighborhoods, including Chinatown, Roxbury, and Downtown Crossing. It also runs through tourist destinations such as Back Bay and the tony South End. The Orange Line also connects with the Green Line (North Station, Haymarket, Downtown Crossing), Blue Line (State), Red Line (South Station), and Silver Line (Downtown Crossing, Chinatown, New England Medical Center). The newest of Boston’s subway lines, the Silver Line actually consists of buses – not trolley cars – that travel in a dedicated lane both above and underground. If you’re looking to get to Logan from downtown Boston by way of public transportation, the Silver Line is the way to go. Pick it up at South Station, and it will drop you at your specific terminal within 15 minutes. The Blue Line can also be taken from Government Center to Logan, however, once you arrive at Maverick station, you will then need to board a separate shuttle bus to take you to the proper terminal. The Silver Line also connects with the Green Line (Boylston), Red Line (Downtown Crossing), and Orange Line (Chinatown, New England Medical Center, Downtown Crossing).